With remote control, automatic warming, cold resistance. Product waterproof grade IP65, power supply waterproof grade Ip44. The colorful lights patterns fired on the front of your home, offers a nice atmosphere and the appearance of holiday spirit. 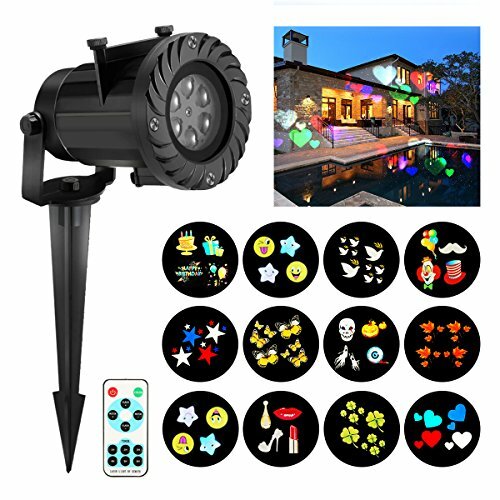 Easy way to decorate, it can be placed anywhere you like in your garden and just need to connect it to get colorful patterns illuminating the night instantly. JELEGANT Amazon seller, was established in 2016, actively research and develop high-quality products, and providing excellent services. The company has developed a number of own-brand products, to provide consumers with more choice, customers' satisfaction is our pursuit. 1. If you have any questions, please leave us a message via e-mail, we will reply to you within 24 hours. 2. If you are not satisfied with our products, please contact us and we will solve your problem ASAP, and make you satisfied. 3. If you are very satisfied with our products, please leave your valuable feedback. We will always provide the best service, thank you for your support. [12PCS SLIDES]: With12 pcs Switchable Pattern, birthday, peace dove, maple leaf, high heel, star, heart shape, star, heart shape, clown, chrismas, halloween, clover and smile. Designed for Christmas, New year, Valentines day, birthday, party, holiday, Halloween. [Waterproof]: Waterproof Led Light, suit for both indoor and outdoor use. Withstanding all kinds of weather. Do not worry the weather will affect the effect. [Easy To Decorate]: Christmas lights can be placed anywhere you like in your garden. Just plug and play, you can get colorful patterns illuminating the night instantly. [Convenient To Use]: With 6 hours on and 18hours off. Insert the pattern lens, plug in, then you can enjoy the light show. The project area: 15 - 200 squares. [Energy Efficient]: With 4 x1 w high brightness and energy-saving LED beads. Output voltage: 6V, 1.2A. Stable quality and high safety performance. If you have any questions about this product by JELEGANT, contact us by completing and submitting the form below. If you are looking for a specif part number, please include it with your message.